A Mentone man was arraigned in a Steuben County court Monday afternoon where he was charged with a class A felony charge of child molestation. David John Elleneberger, 25, was arrested Saturday at the Potawatomi Inn at Pokagon State Park in Angola after allegedly molesting a 4-year-old in a public restroom. Steuben County Sheriff’s Department deputies were called to the inn where they found Elleneberger being detained by several adults at the hotel. Elleneberger allegedly approached the child in a restroom near the pool area of the inn where the incident was said to have occurred. Deputies transported Elleneberger to the sheriff’s department where formal interviews were conducted by detectives. 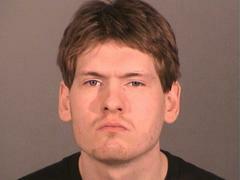 During the interviews, Steuben County authorities say Elleneberger confessed to the molestation. Elleneberger’s bond was set at $100,000. He was released from custody shortly after Monday’s hearing upon posting bond. The child and his family were vacationing at the park from another state and did not know Elleneberger, according to investigators. The Indiana Department of Natural Resources Law Enforcement Division Investigators assisted SCSO Detectives with the interviews and investigation.